With gorgeous, natural landscapes and Four Peaks Wilderness Trail, Mesa, one of the oldest cities in the state of Arizona and the third largest, is a great spot for a desert home. The Superstition Mountains has loaned its name to many places in Mesa, like the Superstition Springs Mall. 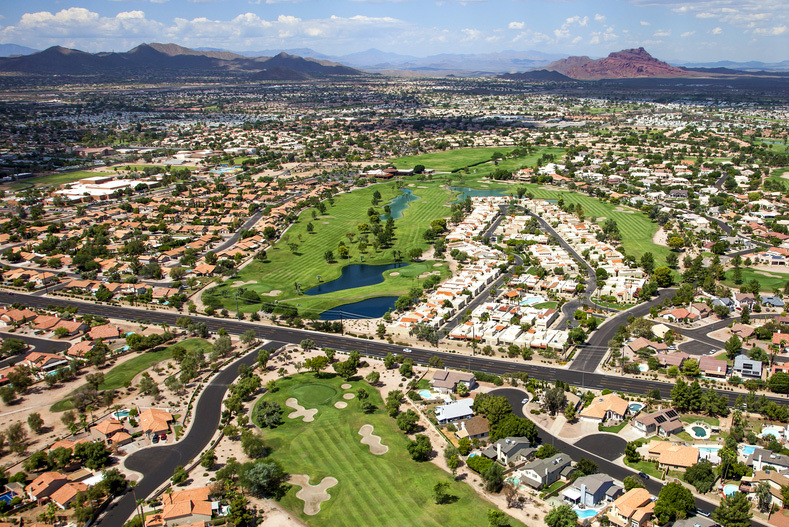 Located in the East Valley, Mesa is a short drive away from the Phoenix Sky Harbor International Airport thanks to its easy access to both the Loop 101 and the US Route 60, and also houses the Phoenix- Mesa Gateway Airport. Mesa is bordered by Gilbert, Tempe, and the Salt River Reservation. The light rail in Mesa runs through the city and to other parts of the valley and can even take you from downtown Mesa to Sky Harbor Airport. Mesa Public Schools offers education for children from kindergarten to high school graduation, so your kids can make lifelong friendships. Youth sports programs and recreational facilities available at school make your kids’ athletics convenient for you and fun for them and their friends. There are also multiple private schools located in and around Mesa for you and your child to call home such as Queen of Peace, Christ the King School, Kimber Academy, and Saguaro Hills Christian Schools. Mesa holds Arizona State University’s (ASU) Polytechnic Campus, part of the largest college campus in the United States. The city is also close to the Tempe campus. Within Mesa are art centers and Mesa Community College, and features Sunsplash and Golfland, a combined water park and miniature golf facility. On the second Friday of every month, the 2nd Friday Out, Main Street in Mesa offers live band performances, activities for kids, frozen treats in the summer, art walks, and shops and restaurants that are open late. For family fun and serene views of desert wildlife while you cool off during the summer, you could try tubing in the Salt River near Saguaro Lake. The Chicago Cubs even have spring training at Sloan Park in Mesa every year with tickets available to the public. There are multiple active adult communities, some with custom homes, located in Mesa that feature full event schedules with activities such as dance parties, running, cruises, lunches, and 27-hole golfing. Recreation centers and pools within these communities are also open to adult residents. There are also assisted living and memory care facilities within some communities. Many upscale neighborhoods are located near the Usery Mountain Regional Park in Mesa with available hiking trails for your leisure. There is a resort-style, gated community with some Mediterranean architecture and is a great place to find a unique luxury home. Within one community are a clock tower, heated pool and spa, fitness center, tennis court, event spaces, schools, shopping, and dining. Some other neighborhoods in Mesa are painted with green vegetation and wildlife of all kinds. Components like a ballroom for weddings and parties, a pool and spa, two tennis courts, and a fitness center are dispersed throughout some communities, as well as the Las Sendas Golf Club. Homes in this area are large and spacious, with great yard space and views tailored for all. Other communities feature homes from multiple builders—you can find a unique home that is right for you in a neighborhood that includes many of the same amenities as the most lavish communities in Mesa. Call us today for an exclusive showing in one of these high-end neighborhoods at 480-786-6100. Think Mesa might be right for you? Start your Mesa home search here.